Kallisti Thera hotel islocated in the center of Fira town within a few minutes away from the rim of the caldera. It consists of 50 elegant guest rooms. This beautiful hotel supplies the guest with all the necessary services along with a luxurious outdoor swimming pool ( sun beds & parasols), an open air Jacuzzi, the Pergola snack-pool bar where you can enjoy exotic drinks! 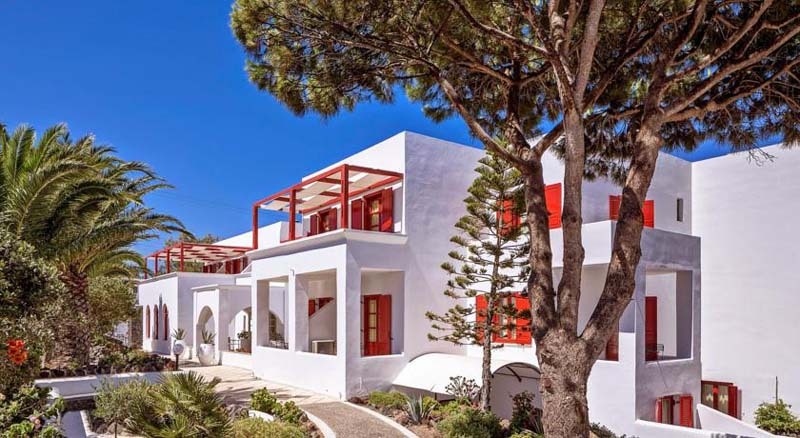 A typical Aegean Cycladic architecture, new design details and materials sourced from the stones of volcano emphasize the magnificent beauty of the surroundings. The hotel rooms were renovated and exclusively designed to suit individual tastes and each personality, decorated in warm earth tones and shades of white. Standard Double room: Bedroom with Double or Twin Bed, bathroom with bathtub or shower. Private balcony with Pool view or Veranda with Garden view. Superior Double room: Spacious bedroom with Double bed, bathroom with bathtub or shower. Private balcony with Sea or Garden view. Junior Suite: Open air Bedroom with Double and single beds that can accommodate 2 to 4 persons. Bathroom with bathtub or shower, Private balcony with Pool or Garden view. Honeymoon Suite: Spacious bedroom and living room, Bathroom with bath tub.Private balcony with Sea or Garden view.